Still got firewood, still got wild turkeys, still got cold temps, but it was a blue sky day. 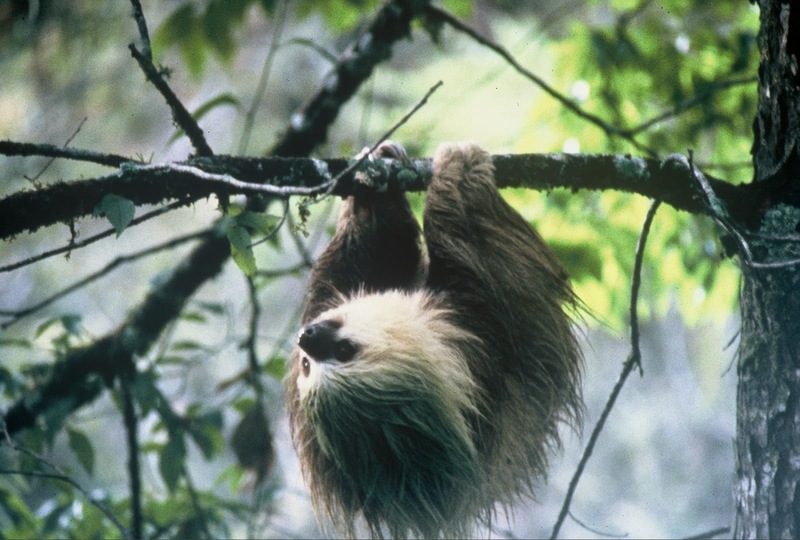 Sloths move sloooowly and maybe now we know why: they eat algae from their own coat. So no need (or ability) for speed to chase animal prey or to travel far to find food. 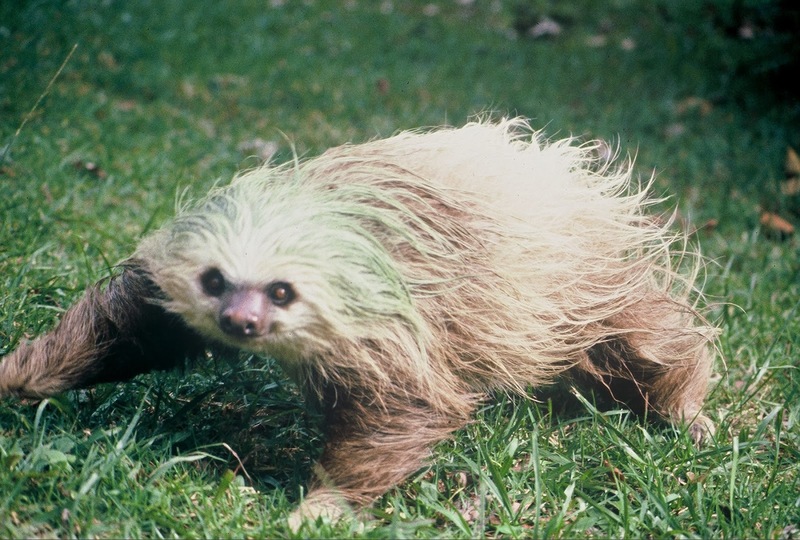 The algae is right there, on their body, and it leaves a green-tint to the sloth's fur. The three-toed sloth carries around an entire ecosystem, which includes the sloth, a moth, fungi and bacteria, and a species of algae. This comes via research by University of Wisconsin biologists highlighted in a New York Times article by Nicholas Wade. The three-toed (actually better described as three-clawed) sloth lives in tropical trees, in Central and South America. I saw these tree-dwelling mammals in Panama in 1983. While there I witnessed the once-a-week ritual when the sloth climbs down from its tree perch to defecate. At the time I did not appreciate the complexity of the sloth's living arrangement. Although I knew it liked to hang from its favorite tree. Biologists used to think that the green coloring on a sloth's fur was for camouflage, to hide it from its main predators--a jaguar on the ground or a harpy eagle from above. 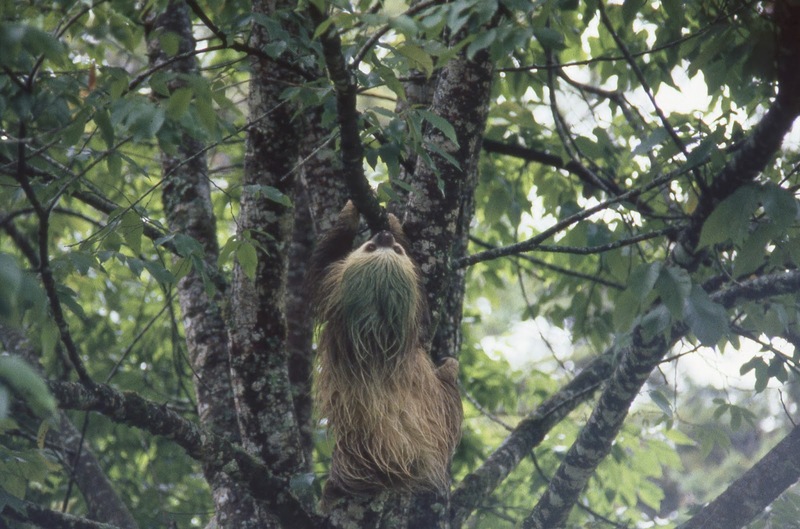 But now it seems that the sloth maintains its own mini food web that includes the green algae. A species of moth lives in the sloth's fur coat. When the sloth climbs down from the tree every week or so to relieve itself, the accompanying pregnant moths lay eggs in the fresh dung. The moth caterpillars hatch and feed on the dung, rather than on plant material like most caterpillars. Eventually, after the larvae turn into adult moths, they flutter up to find the sloth host and a mate. Some of the moths die (probably all the males) and decompose on the sloth, helped by fungi and bacteria that also live there. The by-products of the decaying process, including nitrogen, feed the algae, which in turn is eaten by the sloth. Now that is a cool story to warm your body on a cold winter day. I'm reminded of the breeding bunnies this weekend while visiting my parents at Winterberry Farm. A few inches of fresh powdery snow provides an excellent canvas for animal tracks--rabbit, coyote, meadow vole, fox. The "Back Forty" is a mix of pastures, crop fields, thickets, woods, and wetlands. The field-wood edges are a mix of native shrubs. small trees, and multiflora rose (and a few other invasive plants). Rabbits find good cover in the thorny rose thickets. They also nibble on the rose stems and hop out into the crop fields where they find some greenery. I've posted about these rabbits before, but on this visit they seem to be everywhere--breeding like....well, rabbits. Henna flushed several from their thickets, but bunnies are fast, too fast for the dogs and apparently the local coyotes as well. We saw fresh coyote tracks, although no sign that one caught up with a rabbit. Cold, crisp winter air keeps us bundled up against the wind chill. Wild animals seem to fare fine, if the network of rabbit tracks are any indication. The modest January thaw lasted about a week, causing a lot of ice and snow to melt away, although not completely in these parts. Today, the daytime temperature is hovering in the mid-teens, nighttime lows will approach zero degrees for the next few days, the wind is going to pick up, and snow is on the way. We are back to full-on winter. Our wood stove is burning through a lot of wood, and firewood dealers in the region are running low on supplies. We might need another dry cord; not such good planning. The six female turkeys have returned to the yard, visiting two to three times each day. (Our neighbors continue to put out food for them.) They didn't come much during the thaw, when temperatures were in the mid-40s. Black-capped chickadees and their mixed flock mates--tufted titmice--were busy in the yard today. They ate seeds at the feeders and gleaned insects from the hardwood trees. To stay warm they foraged and shivered and puffed up their feathers. At night they will huddle together in a cavity somewhere; however, some may not live till morning. I'm thinking that our town road agent is also stressed by these winter conditions. Every year his salt and sand fund is scrutinized for potential budget cuts. Those doing the perusing are looking at last year's expenditures to set a budget for next year (not the current winter). So, this winter's road budget was set more than a year ago. It is hard to predict a year out how many times the plow trucks will be sent out to make the roads safe for human travel. Maybe, like the chickadees, Rick the road agent has some winter coping mechanisms. Meanwhile, I sat by the wood stove and ordered vegetable and flower seeds and potato tubers from Fedco and tree seedlings from the New Hampshire State Forest Nursery. 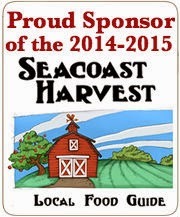 Only three months till planting time. Four days in a row with daytime temps above 40F. Snow has melted and left bare patches on the snowmobile trails through the woods. Even more bare ground today as a result of a steady, warmish rain. Snowmobiling is likely done in our region until we get another fresh snow. But the melting snow and rain and fog and damp air does not deter our walkabouts. Henna races down the trails (pulling me) regardless of what is underfoot or in the air. Kodi and Henna also find a lot more tasty things in the soft snow. Things that I wish they would not eat. Yesterday we were intrigued by the geometric shapes of ice crystals created where a wetland was melting around its edges. Today, after more melting, there were other strange patterns. I took the following picture to capture the raindrops on water and the ice bubbles and the yellow tint. When I got home and looked at the photo, I thought a cowboy with boot spurs had jumped in front of the camera. Alas it was the shadow of a red maple, reflected in the water. Fog is settling in this afternoon, darkness will come early. I'm enjoying this January Thaw, including the gray and the fog and the rain. I see many more textures and patterns in this kind of weather. Besides, it will get cold again. As the week goes on temperatures are going to creep slowly back down toward freezing. Everyone I think would agree by now that the weather of late has been weird, or at least acknowledge that the temperature swings are mildly alarming. On Saturday, December 28th there were record high temperatures in many places. Yesterday, record lows, actually record low high temperatures for the day. Regardless, it's been cold. Yet yesterday it rained all day in New England. Today below zero wind chills. The ups and downs take a toll on the body (and air traffic--so glad I am not flying anywhere this week). The dogs and I are visiting my parents at Winterberry Farm in western Massachusetts. Not as much snow here, but temperatures still cold, except yesterday when it rained and washed away most of the snow, leaving a treacherous sheet of ice here and there. We've seen lots of sign of cottontail rabbits (this would be the common eastern cottontail). They live in the thickets at the edge of the farm fields. We see their tracks, and lots of rabbit droppings, and only occasionally the rabbits themselves. Henna has very keen ears and eyes for anything that moves. And the rabbit pellets look a lot (nearly identical) to the treats we give her, maybe they taste just as good too, as she reaches in among the thorns to snack on a few. The rabbit sign sightings were on Sunday, before all the snow melted on Monday. Today, bundled against the wind chill, the most visible animal signs that we saw were the myriad vole tunnels now exposed. These subnivean tunnels--built below the snow pack--provide warm and safe travel-ways for meadow voles and shrews. Once the snow melts away, the voles and their tunnels are left exposed. Although owls, hawks, foxes, and coyotes prefer it that way. 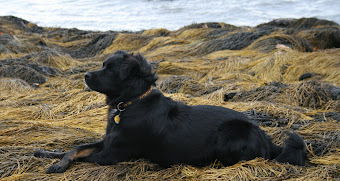 We visited Seapoint and Crescent Beaches--and the point of land that separates the two--in Kittery, Maine a few hours past high tide this afternoon. The air temperature was 25 F; it felt balmy compared to the overnight sub-zero temps, although we still wore long underwear. We had this stretch of coastline mostly to ourselves. (We marvel that so few people visit beaches in winter--though that is why we like it so.). A flock of wintering purple sandpipers (they nest in the high-arctic and winter on Maine rocky coasts) roosted on ice-covered rocks as waves crashed around them, sanderlings and ruddy turnstones probed the equally chilly tideline. Such hardy shorebirds to endure a northern winter's shore. 6 AM: At minus eight degrees Fahrenheit the cold snow crunches and squeaks underfoot. We stop only long enough for Kodi to lick road salt off his foot pads. We can't hear each other as we walk, the crunching snow is loud and we are wearing tight-fitting balaclavas that cover our head, ears, and neck. The winds are calm, which saves our exposed faces from getting wind-chilled. By the time we're back home from the 2-mile walk we've warmed up, even sweating. Without Kodi and Henna we never would have ventured out in sub-zero darkness, and end up feeling refreshed from the bracing walk. Our dearest dogs egged us on during these past few days of cold and snow--first, second, third, sometimes a fourth walk. As long as we dressed properly, we didn't really notice the cold. The snow is beautiful: covering the forest floor, in large drifts along field edges, coating the northerly side of tree trunks like white paint stripes on roads, in winter shadows and in the crotch of a tree. Around 7:30 am six female turkeys marched into our neighbor's yard from the back woods. They came from the southeast; I think they roost in the big white pines along the wetland edge. Our neighbors started putting out feed in December, so turkeys are now a daily feature in our yard too; they scratch around the base of our bird feeders. The females left after about 30 minutes, in single file they retraced their route back through the woods. About an hour later six males with long beards marched single file to our neighbor's backyard following the same path as the females. Presumably the female turkeys clucked a bit of information to the males back in the woods somewhere. Or maybe the males just rousted themselves out of their tree roosts later than the females. Here are two of the males under our feeders; note the long "beards" that hang down from their breast. By late morning the temperature was in the high teens, the sky was mostly blue, and despite a light but brisk wind it was a good time for a walk on our now favorite nearby trails at the Piscassic River Wildlife Management Area. Kodi and Henna are always game for this outing, stopping now and then to joust with each other. When we returned to the car a turkey vulture soared overhead. There was a time that vultures were rare in New Hampshire, and never seen in winter. Now they are year-rounders. Not sure if the vulture sensed the pending storm, but it didn't seem to be in a hurry or rattled by the cold wind. We on the other hand, re-stacked a row of firewood, made kindling, and filled the wood box, in advance of a winter storm that may or may not bring a lot of snow, but surely will bring blowing snow, below zero temps, and even colder wind chill. Happy New Year All---stay warm and stay safe.